Knowing when a coffee has been roasted is part of the provenance of the coffee. We aim to provide as much information about the journey of the coffee as we can, and as the roasting is a fundamental part of this journey, we feel it is important to include this information on the bag. In the days after roasting the flavours in coffee can develop. Coupled with this is the degassing of the beans themselves (a build up of carbon dioxide in the bean during the roasting is released over time). There is a period after roasting when the coffee is at its best. We continuously taste our coffee at the Roastery, and at home, and have developed an understanding of when our coffee tastes best. This is our opinion, however, and we offer the following as a guide to perhaps be followed loosely, rather than something to be slavishly followed. In terms of coffee extracted through an espresso machine we tend to rest the coffee for at least three days before using. More often we will rest the coffee for a week to ten days. We’ve found the coffee to be at its peak between 10 and 21 days after roasting. Having said that we often sample espresso within a day of roasting, and sometimes straight out of the roaster itself! It might not be at its best but it’s still pretty good. If we brew coffee by other means, such as filter, coffee press (cafetiere) or Aeropress, we tend to find we can use the coffee pretty much straight away. We always provide tasting notes with our coffee. Again these are very much personal opinions and are usually a culmination of heated discussion around which flavours are evident. These flavours come from volatile compounds within the roasted coffee, and these oxidise over time. We tend to notice these flavours begin to tail off around a month after roasting. 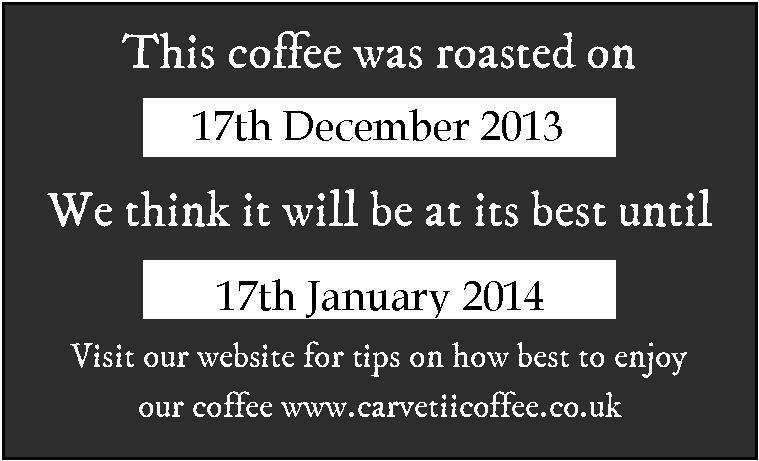 What remains is a decent coffee but it may be harder to pick out the flavours outlined in our tasting notes. It might also be worth mentioning how best to store our coffee. Essentially storage should be about protecting those volatile compounds. Our advice is to store the coffee in its original packaging, rolling the bag up after each use to remove as much air as possible. Then keep the coffee in a cupboard; we tend to avoid using fridges and freezers. Finally, a little note on grinding. All of the above is based upon storing the coffee in whole bean form and grinding portions as you need them. Ground coffee oxidises very quickly – we see a noticeable difference within around 30 minutes of grinding. We’re always happy to respond to questions about coffee so please feel free to comment on this post or drop us an email at info@carvetiicoffee.co.uk. If you’re really interested in developing your understanding of coffee further then why not book a place on one of our coffee brewing workshops.